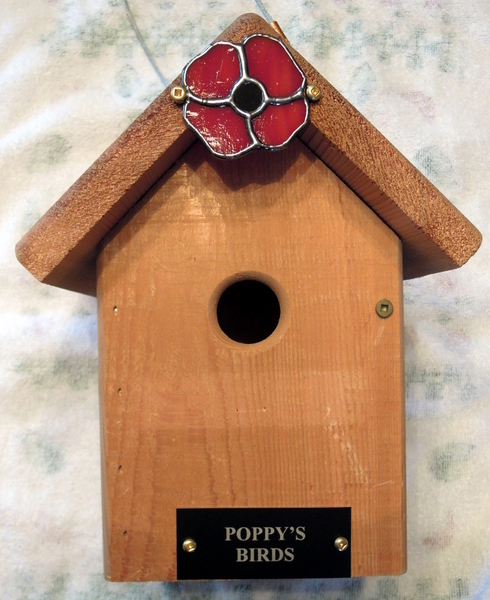 For our oldest granddaughter Poppy’s 1st Christmas we obtained this Wren/Nuthatch bird house from The Wild Bird Store in Calgary and attached the small stained glass poppy. Poppy’s mom and dad have a large treed back yard in Calgary with lots of many varieties of birds, bird feeders and bird houses. As of last report it appeared that chickadees were moving in/or just helping themselves to nesting material already deposited there. It will be interesting to see who gets to use it. 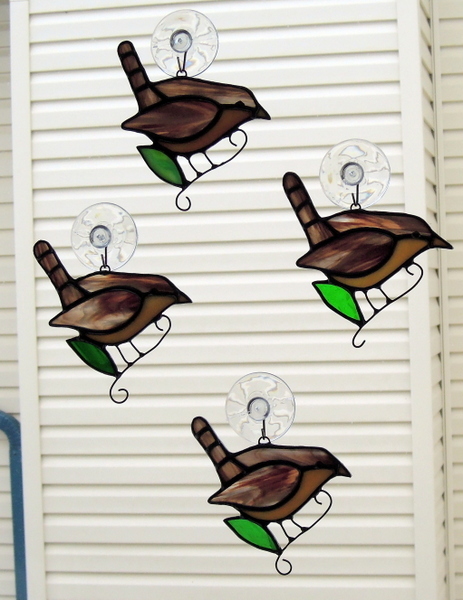 These 4 Wrens are now available at The Wild Bird Store in Calgary. The measure approximately 4 inches by 4.5 inches and we used mostly Spectrum Glass, also 16 gauge tinned wire was used for the branch and the Wren legs. 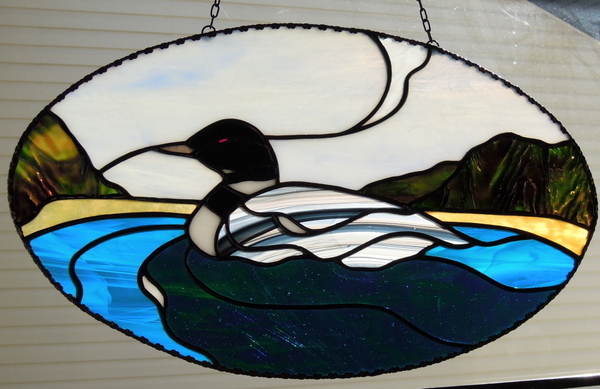 In the spring of 2011 we made this Loon panel which was commissioned as a gift by the Order of Eastern Star. 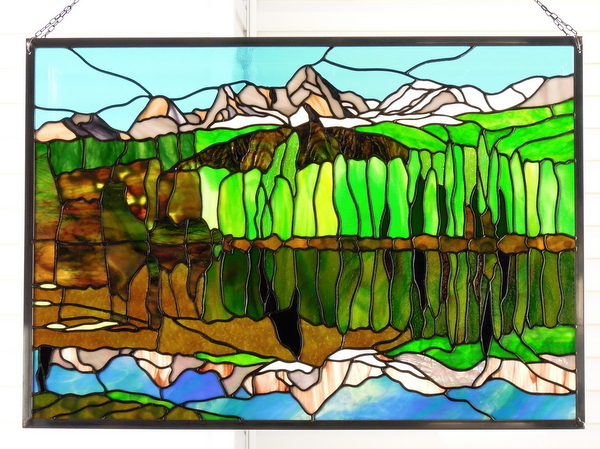 The panel measures 16 inches wide by 9.5 inches high. The body of the Loon was made from one piece of Spectrum’s Black/White/Clear Baroque. 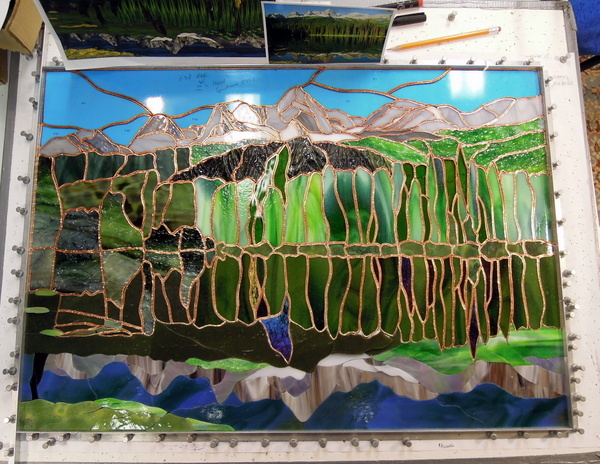 For the hills we used a Uroboros Herringbone and the lighter blue in the water was Spectrum’s Sky/Blue wispy and the darker water glass was a Kokomo. In Celebration of Innisfail’s 50th Anniversary of their Figure Skating Club we donated this pair of figure skates. 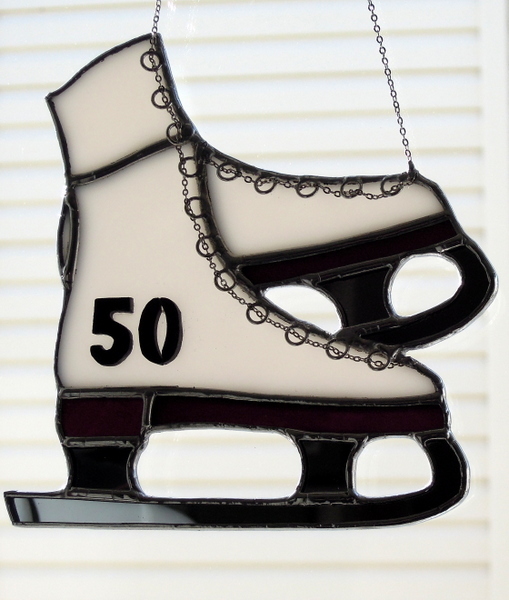 For the chrome blades we used mirror glass and the 50 was cut from Spectrum Black Cathedral and overlaid on the skates using E6000 glue.